Hi, I've got a 51 styleline 4dr sedan that I'm bringing back from the dead as a project car. Managed to purchase and sort out all parts required. At least that's what I thought. I'm missing two pieces on both driver & passenger side that I can't seem to locate a part number or description for. Would appreciate your assistance and if possible where to purchase them. eBay had been my best friend so far but parts seem to be very rare for the 51. Last time I was out there Syness Auto Salvage of Helena Mt had a 51 sitting way out in the back. It was a rust bucket but seemed to have all the front end parts. I would go look but sadly my yard cruising days are over. Thanks. I'll see if I can email them and ask for remote help. I've looked at your photos...specifically the ones with the pointing hand. Since you are in Egypt and obviously ordering parts from the U.S. I wonder if you didn't get the wrong inner fenders. 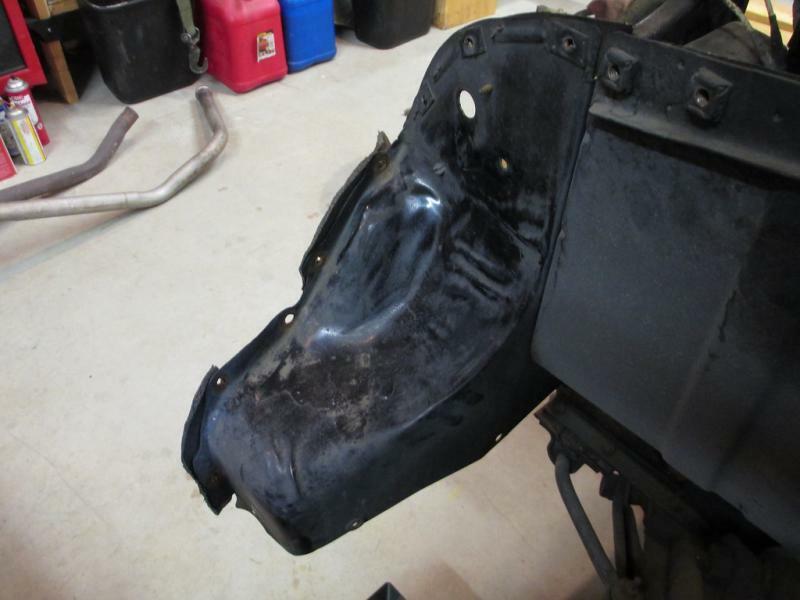 If you look at yours, you will see that the front most part is riveted to the rear part. The rear part is pretty much interchangeable from 49-52. The front part however is year specific. It was broken down as 49-50, 51-52. I may be wrong [hard to tell for sure in your photos] but I have a suspicion that you may have the 49-50 front section on your inner fenders. The other photos indicate a missing "U" channel that connects from the frame, goes across and under the two panels [second photo]. The other angled baffle similarly attaches to the frame and the bottom of the fender [third photo]. Below is a photo of the differences between the 1949-50 [bottom] and the 1951-52 [top] front valance. You can see that the 49-50 valance would fill-in the section that is in question in your photos with the pointing hand. Also a photo of the front piece of the 49-50 inner fender. If your inner fender looks like this, you do not have the right front part as it was redesigned for the different 51-52 fender and grille. It seems to me that I've seen an exploded view of the front sheet metal somewhere. This would show and you would be able to pin point exactly what you are missing. There were some changes from year to year that I have noticed in parting out quite a few of these cars unless they had been removed or added by previous owners. It seems to me that I've seen an exploded view of the front sheet metal somewhere. 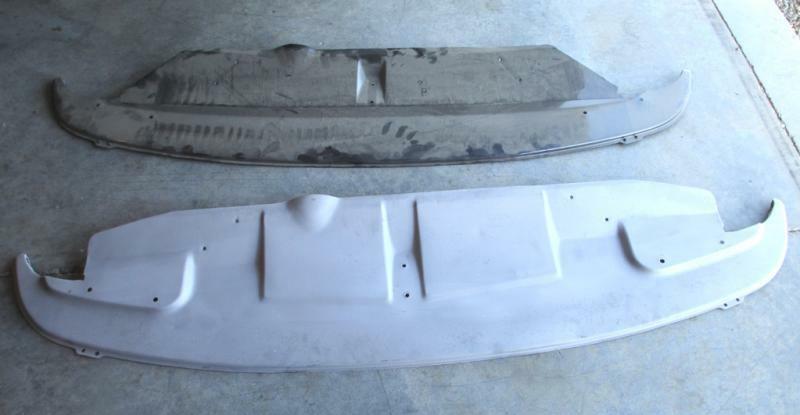 eplantage, I initially posted that photo of the 1949 front end sheet metal, but I didn't think that it adequately showed the differences that I believe Mmnimer is dealing with. Hi Mohamed. Was your car imported or sold new in Your country. Is it RHD or LHD.? I'm pretty sure this car was bought new in Egypt, since we had the highest US car sales In the middle East at that time. It was a 3 speed manual LHD, but I'm upgrading this to a powerglide. Again another photo showing the part I'm missing. Any idea. It would appear that the front valance is not matching up with your inner fenders. There is not a separate piece that fills that space. If you note the photos that Ram posted earlier you will find that the profile of the lower/ light gray one fits your inner fenders more completely. So either a different valance to match the inner fenders or different inner fenders to match the front valance you already have. Hi Mohamed. Can you get the opportunity to drive a genuine 51-52 Powerglide car before you try this conversion? Even though they had the larger 235 engine and higher spec performance they are really sluggish to drive. Apart from more power the Powerglide cars had a different brake master cylinder, revised transmision mounts, a different differential ratio, a different shift mechanism etc. If you don't have a donor vehicle there this is a very challenging conversion, for very limited gain. Edited by Bel Air kiwi on 04-11-19 09:06 PM. Reason for edit: No reason given. I looked at a couple of spare parts I have at home last night. I believe what you have pictured is the correct front valance for a 51. A couple of questions. Do the holes on the inner fender extensions, to the front of the radiator support, match the holes in the front fenders where the grille will be attached? If not then you have the incorrect inner fenders. Those inner fenders will attach around the perimeter of the front valance and the front fender will be attached and sandwiched in between the inner fender and the grille through the same matching holes. hope this makes sense to you.